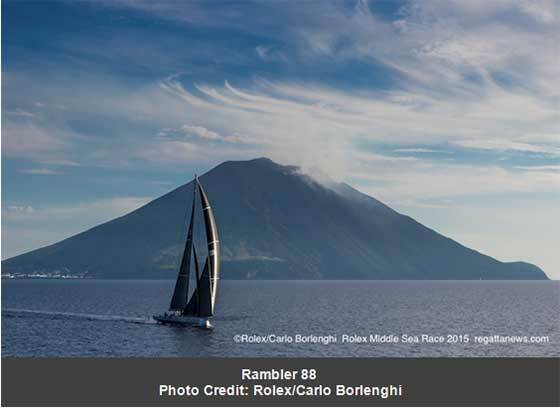 As the sun rose over Stromboli on the third day of the Rolex Middle Sea Race, close to half of the 111-strong fleet had passed the active volcano on the northeastern most point of the 608-mile course. American Maxi, Rambler 88 was the first monohull to pass Stromboli, just before sunset. Skipper, George David was reminiscing about the last occasion he passed the 'Lighthouse of the Mediterranean'. "It could not be a nicer afternoon than it is, with 11 knots of wind speed, VMG sailing." commented George David from the helm of Rambler 88. "The sun is about an hour from setting, Stromboli is over our left shoulder, it must be about 25,000 feet high and I didn't realise there was a village on the north shore. Last time I was here in 2007, we passed at around 1am, we were having a much faster race then, that's the year we set the record and Stromboli lit up with a proper eruption in the middle of the night, so there is not a nicer place to sail anywhere than right here, right now." At 0800 CET on Day 3, Lloyd Thornburg's MOD 70 Phaedo3 was passing Pantelleria, 220 miles from the finish. The American trimaran is expected to arrive at the Royal Malta Yacht Club early tomorrow morning but that could easily change with the wind speed. Rambler 88 was just two hours behind Phaedo3 at 0800 CET, both yachts are experiencing upwind conditions, which are expected to continue throughout today. 54 yachts had passed Stromboli this morning, giving an accurate picture of the overall leader racing under IRC for the Rolex Middle Sea Race Trophy and for the six individual IRC Classes. Lee Satariano and Christian Ripard's Maltese J/122 Artie was the overall leader at Stromboli this morning, an hour ahead of the Czech Republic team racing Xp-44, Vikesha II, sailed by Igor Skalin. Costantin Manuele's Italian First 40.7, Canevel Spumanti was third after time correction. At 0800 CET on Day Three of the Rolex Middle Sea Race, the fleet was extremely well spread out, 250 mlles separating the front to the back of the fleet. Two Italian yachts with highly experienced crews are performing well. 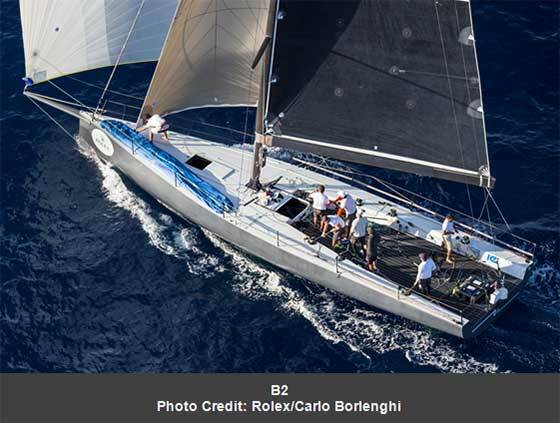 Michele Galli's Italian TP52, B2 was just three miles from Vincenzo Onorato's Italian Cookson 50, Mascalzone Latino. The two yachts were negotiating an area of little breeze off Palermo. 50 miles away reaching the fresh southerly breeze at Favignana will be the next goal and by estimation only, these two yachts are in a strong position for the overall win. 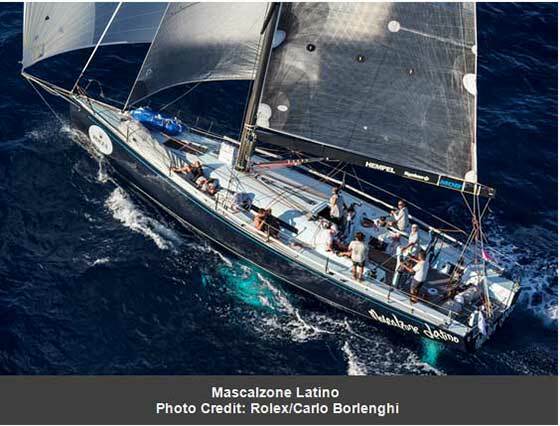 On board Mascalzone Latino, Italian tactician Flavio Favini, has won eight world championships in various classes and taken Line Honours in the Rolex Middle Sea Race on two occasions with Esimit Europa II. Mascalzone Latino Irish navigator, Ian Moore, was tactician with Bella Mente, winning last month's Rolex Maxi 72 World Championship. Ian has also won the Rolex Middle Sea Race as navigator with Lucky in 2010. On board B2, Italian tactician Francesco de Angelis, has won six world championships in different classes and the Louis Vuitton Cup. B2's Spanish navigator, Nacho Postigo has won five world championships and the TP52 Mediterranean championship. Francesco and Nacho formed the after-guard for B2's overall win of the Rolex Middle Sea Race in 2013. IRC 1: Hungarian RP60, Wild Joe, sailed by Marton Jozsa. 44 minutes from Jan-Henrik Kisteit's German Maxi 72, Momo. IRC 2: Mascalzone Latino. 17 minutes from TP52, B2. IRC 3: Bastiaan de Voogd Dutch team racing Sydney 43 Coin Coin. 14 minutes from the Turkish Ker 40, Arkas Flying Box, skippered by Serhat Altay. IRC 4: Vikesha II, nearly two hours from Giuseppe Puttini's Swan 65, Shirlaf. Maltese First 45, Elusive II BOV, skippered by Christoph Podesta, was third. IRC 5: Artie was over an hour ahead of Canevel Spumanti. IRC 6: Milan Hajek's Czech Republic team racing First 40.7, Three Sisters 45 minutes from Peppe Fornich's Grand Soleil 37, Sagola-Biotrading. A further update will be posted on the official Rolex Middle Sea web site this afternoon. To follow the race, visit the official Rolex Middle Sea Race web site. All of the competitors are encouraged to contact the media team during the race with stories from the sea, pictures and even videos. All of the competing yachts are fitted with YB trackers showing their position and other telemetric data.